The Hallite 800 double-acting swivel seal, or rotary pressure seal, is designed specifically for use in hydraulic swivel joints for either rod or bore sealing applications. 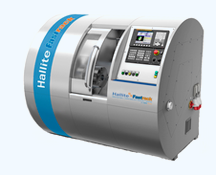 The Hallite 800’s patented design minimises friction between the seal and the rod or bore mating surface. Depending on size, the seal is either a one-piece design or has two acetal anti-extrusion rings which allows for larger extrusion gaps. Both of these configurations can replace the two part seals typically used in this application. Hallite recommends replacing the two part seals with the Hallite 800 to eliminate the possibility of relative movement between the face seal and the energiser. Contact your local Hallite technical team to determine which configuration is best suited for your application. Special pressure activation grooves are incorporated into the design of the seal to enable an immediate seal of the joint. The Hallite 800 is manufactured in Hythane® 181, Hallite’s high-performance polyurethane, for easy installation, excellent low temperature performance, and long service life. * For fluid types marked as possible, please call our team of experts on (02) 9620 7300 to talk through your requirements and determine if this seal is the most suitable for your needs.